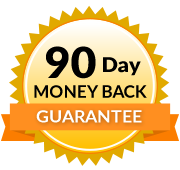 * Take each course when it fits your needs.You may take some course now and save the other courses for your next renewal period if you wish. You'll receive 1 certificate for each course. Note: The Touch for the Seriously Ill course meets the communicable disease requirements of Maryland and most states. Also, if you have extra ethics hours they will qualify as general CE Hours. 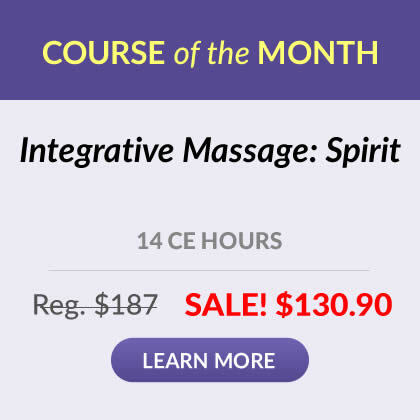 Touch for the Seriously Ill (14 CE Hours): This course provides a rare depth of experience and sensitivity toward giving massage to seriously ill persons. This course meets the communicable disease requirements of Maryland and most states. Massage for Edema (3 CE Hours): Deepen your understanding of the concepts underlying massage therapy with clients who have edema. Chronic Pain Management (5 CE Hours): To study pain and its alleviation is to journey into the relationships between the body, mind and spirit. Learn the most essential points all massage therapists need to know to be more grounded, compassionate and effective in their work with people in chronic pain. 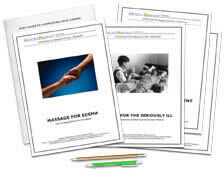 Ethics: Therapeutic Environment (3 Ethics Hours): Expand your understanding of ethics. Learn how to build a safer therapeutic environment for yourself and your client.